This week’s reading in Shemot / Exodus 27:1 states the following, וְעָשִׂ֥יתָ אֶת־הַמִּזְבֵּ֖חַ עֲצֵ֣י שִׁטִּ֑ים חָמֵשׁ֩ אַמּ֨וֹת אֹ֜רֶךְ וְחָמֵ֧שׁ אַמּ֣וֹת רֹ֗חַב רָב֤וּעַ יִהְיֶה֙ הַמִּזְבֵּ֔חַ וְשָׁלֹ֥שׁ אַמּ֖וֹת קֹמָתֽוֹ׃ 27:1 You shall make the altar of acacia wood, five cubits long and five cubits wide—the altar is to be square—and three cubits high. 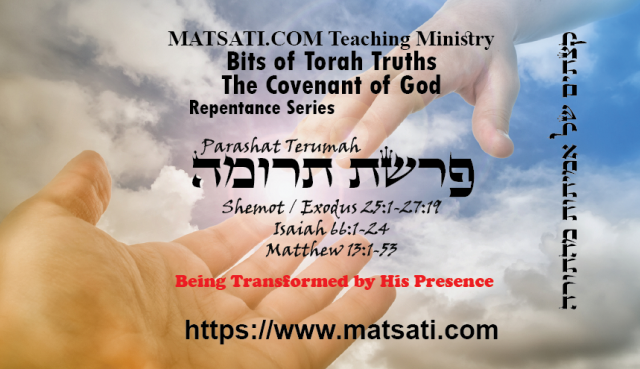 This weeks Torah portion details the free will contribution and the construction of the Tabernacle. The main source for the account of the construction of the Tabernacle is found in the Book of Exodus, specifically Shemot / Exodus 25-31 and 35-40. The Hebrew Bible describes the Tabernacle as a portable earthly dwelling place for the Lord God of Israel to dwell among His people. (Note how He goes where they go, indicating the significance of living a godly life.) This holy place was built of woven layers of curtains along with 48 boards clad together with items made from the gold, silver, brass, furs, jewels, and other valuable materials taken out of Egypt. The Tabernacle was constructed according to God’s design and was carried from place to place during Israel’s journey through the wilderness and to Shiloh during their conquest of the Promised Land. The commentary Daat Zkenim on Shemot / Exodus 27:1 Part 1 states, “‘ועשית את המזבח וגו, ‘you are to construct the altar, etc. ;’the word מזבח here may be understood as an acrostic of the words: מחילה, זכות, ברכה, חיים, ‘forgiveness, merit, blessing, and life.’” Here the rabbis speak of the Hebrew word for the Altar (הַמִּזְבֵּ֔חַ) as an acrostic of the first letter for the words מחילה, זכות, ברכה, חיים respectively. Forgiveness (מחילה), Right / Correct (זכות), to Bless (ברכה), and Life (חיים). Notice how all of these things connect the mercies of God to the altar. This is an important concept as we consider what the Apostle Paul wrote to the Romans in Romans 12:1 Therefore I urge you, brethren, by the mercies of God, to present your bodies a living and holy sacrifice, acceptable to God, which is your spiritual service of worship. 12:2 And do not be conformed to this world, but be transformed by the renewing of your mind, so that you may prove what the will of God is, that which is good and acceptable and perfect. (NASB) What we see here is Paul telling God’s people we are to live our lives based upon the mercies of God. This means we are called to do something with our lives. Paul wants us to give our bodies to God as a sacrifice. Not as a sacrifice to be slaughtered, but as a living sacrifice. This is a description of living upon the altar of God. So what exactly does this mean? Within the context of the construction of the Tabernacle, the Lord dwelling within our midst, the altar brings about remarkable changes in our lives. This directs us to humble our lives before the Lord to the obedience of His Word, to seeking Him in His righteous ways, and trusting in Him to help us every step of the way. By His dwelling in our midst (in our hearts) we are transformed by His presence and we are given a different perspective as we give Him our body, our mind and our spirit, and all of who we are. This appears to be what is being described in the opening sections of Parashat Terumah.